I hardly know where to begin when it comes to remembering His Eminence. He was a gentle, kind, and dedicated priest who had a knack for making one feel special. I recall his enthusiasm back in the late 1990’s when he shared his hopes with me of one day restoring our Basilica to its’ original beauty and splendor. His enthusiasm was infectious and I wanted very much for him to realize his dream. I never imagined that he’d one day invite me to be a presenter of this project to Pope John Paul II. That’s exactly what happened though on October 18, 2001 in Rome. I’ll never forget the sound of his voice and the pride on his face when he introduced me to the pontiff. His support and approval made it possible for us to establish our local guild of the Catholic Medical Association in the Archdiocese of Baltimore years later. In has later years it was my privilege and honor to pay him regular visits at Mercy Ridge retirement facility and then St. Martin’s home. The Sunday and day before he passed on, I had the opportunity to pray a Divine Mercy chaplet at his bedside and silently recall many good memories of him. Before I left him that last time on Wednesday, I whispered in his ear that I loved him and would continue to pray for him. I asked him to remember to pray for me when he went to the Father’s house. Farewell to my dear mentor you will not be forgotten. 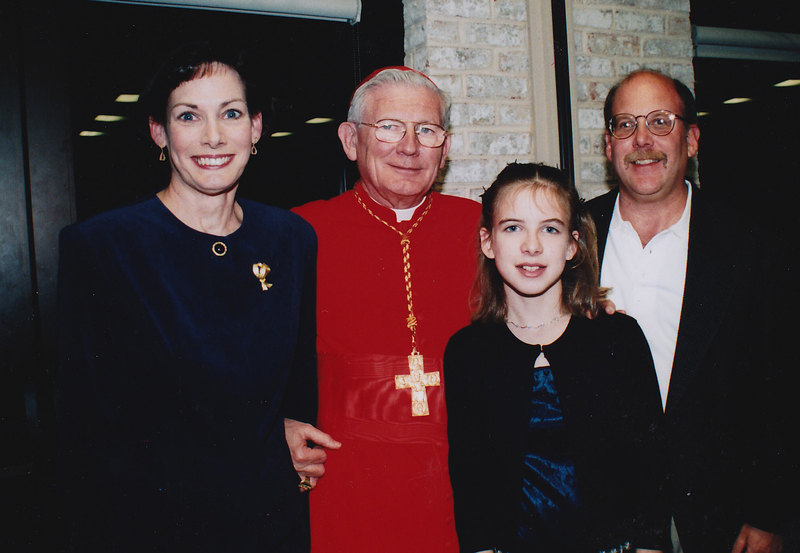 Cardinal Keeler was the kind of person who loved everyone. During his ministry he brought people together. He was a very special man and Cardinal Keeler is one of the reasons why I am considering the priesthood. He touched the lives of many people. 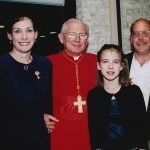 I remember first seeing Cardinal Keeler at St. Mary’s Catholic Church in Hagerstown back in 2004 for the funeral for the former pastor of the church. It was something watching him celebrate the mass. He sure did reach out to the community to teach the gospel in the Archdiocese . He loved the Archdiocese of Baltimore and will be greatly missed. 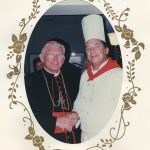 My husband assisted a breakfast for the Pope in Baltimore and was lucky enough to shake hands with Cardinal Keeler and get a photograph. When our Community of the All Saints Sisters of the Poor was received into the Roman Catholic Church, Cardinal Keeler made it a point to welcome us into the Archdiocese of Baltimore family. Following the Latin Mass at St. Alphonsus Liguori one Sunday, the Cardinal took the time to speak with each one of us, individually, to share a word of greeting and encouragement. It didn’t seem to matter that there were many other people waiting to greet him. His unhurried attention spoke volumes to us and endeared him to us forever. May he rest in peace and rise in glory. 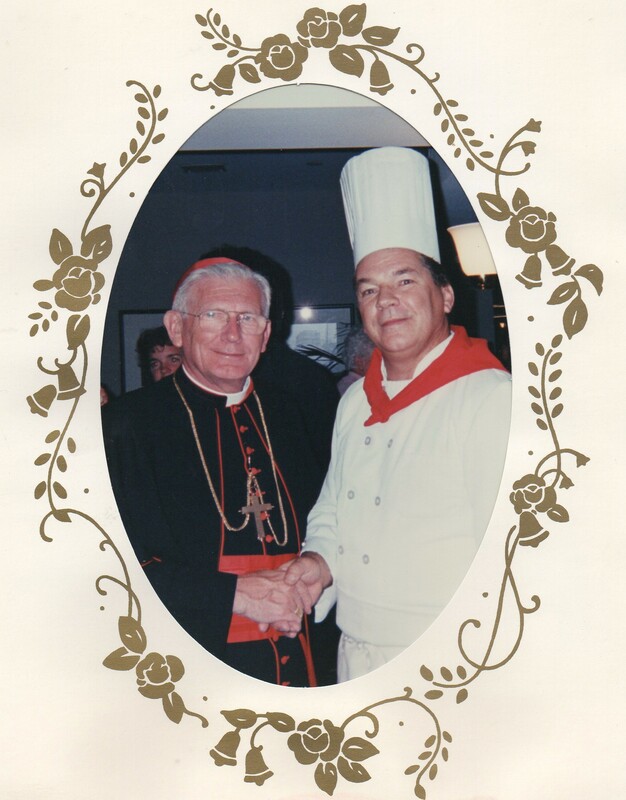 I was happy to attend Cardinal Keeler’s Installation, as Archbishop of Baltimore, as a member of the Archdiocesan Choir, in 1989. I was very pleased to be at Camden Yards, for Pope St. John-Paul II visit. May he Rest in Peace. I meant to mention that we travelled all over the East Coast and I even accompanied him on a trip to the Vatican. I was by his side at the funeral of Cardinal Dulles funeral at St. Patricks in New York. I am not afraid to say that I loved him! A wonderful human being and great friend of mine. He is now getting his eternal reward. He was the most important person in my life. God Bless You! 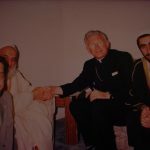 In 2003, Cardinal Keeler agreed to meet with 2 laypersons who asked permission and his blessing to go directly to parishes and ask parishioners to pray for and support a totally (non-existent!) pro-life, non-contraceptive OB/GYN practice in the metro area of the Archdiocese of Baltimore. He was very kind, listened thoughtfully, and not only gave his blessing, but established a way in which his office, per our request, sent an introductory letter to pastors encouraging them to allow the effort before they were directly contacted by the laypersons, over a period of several years. This effort of prayer, which eventually included over 2,000 people in the Anne Arundel County area, was clearly the spiritual catalyst for Natural Fertility Care at St. Agnes. Cardinal Keeler thoughtfully listened, and didn’t think the desire OR the effort for this goal was crazy. Thank you, Cardinal Keeler! Your initial blessing has led to countless changed hearts and joyful families! I just wanted to express my deepest sympathy for the family and close friends of the late Cardinal Keeler. I know that he is forever in paradise with our Lord and Savior. And no more sickness or pain. Thank You for all of your wonderful works on earth.